LUCY BURDETTE: So interesting that Ingrid invited us to contribute to a post on reunions during the same month that I was attending two! These were family reunions, one for my 90-year-old uncle, and one for John's 100 year old cousin (and yes, he has amazing genes.) I thought you might enjoy a little peek into my family's behavior during a get-together. Uncle Don was my father's only brother, four years younger. They were devoted to each other – when my father was ailing, Don called every single day for several years running. Years ago, when John and I were first married, he was attending his first extended family party with me, a 50th wedding anniversary for Don and his bride, Carol. John's family is absorbed (some might say obsessed) with sports. So he wanted to know what equipment to bring along for the weekend. Tennis rackets? Golf clubs? Ping-pong paddles? My cousin Steve responded: when you're with the Isleibs, all you need is a knife and fork. My cousin Tom, who you may remember from his appearance several years ago as our resident Limerick genius, is very interested in genealogy. He made this chart for his father. But much to the dismay of my siblings and me, we were not on it. And I have to confess that we were not gracious about our absence, although he explained very reasonably that he didn't have room. We felt compelled to follow up the next morning with a rejoinder. 2. What was the most disgusting food Don has eaten in his foreign travels, or at home? And finally there came a wonderful game called where in the world is Don Isleib? And a gift exchange, for which we were asked to bring a gift related to some aspect of his life. Here's the birthday boy, exhausted by his big weekend! So that's my family in a nutshell--food, clever wordplay, lots of laughing and teasing. 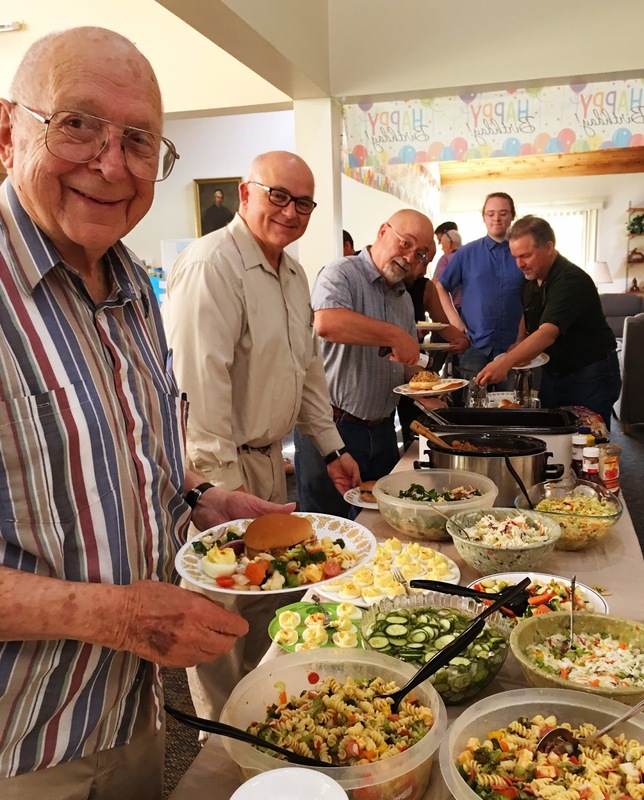 What would your family gathering be like? 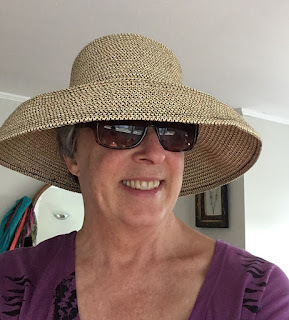 LUCY BURDETTE: I was skimming over the Sisters in Crime listserv a couple of weeks ago, and the discussion turned to plotting versus writing by the seat of your pants. 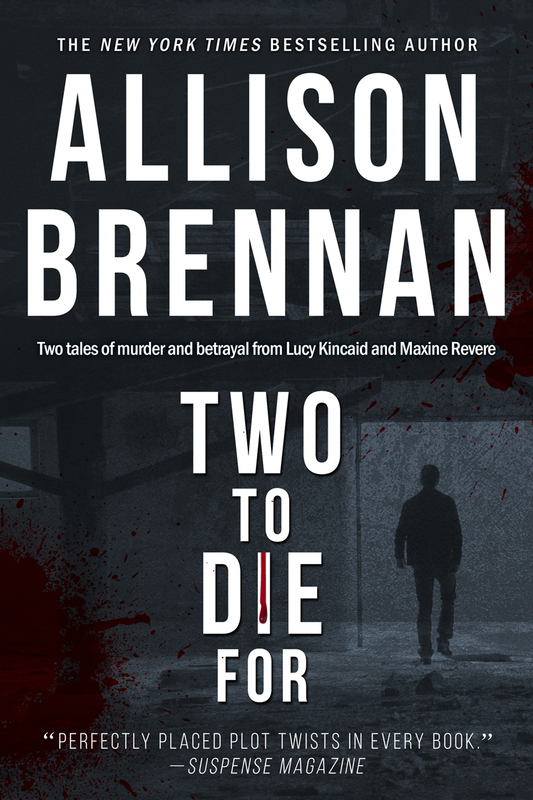 I was absolutely blown away by Allison Brennan's response, and knew instantly that you would want to read about her writing process. Welcome Allison! One of the reasons Patti and I came up with this idea was our mutual frustration at being told that we were “doing it wrong.” That there was an established way to write and those of us who didn’t plot were somehow inferior to those who did. The most important thing is that the writer finish the book. How is almost irrelevant, as long as we reach THE END. Books by authors who heavily outline (Andrew Gross, Suzanne Brockmann, James Patterson) are no better than books by authors who write organically (Stephen King, Nora Roberts, Lee Child.) And vice versa. I’ve had writer friends insist that I must plot because I write mystery/thrillers. I say I don’t. I often don’t even know who the killer is. I sometimes write a great scene and have no idea how my characters are going to get out alive. Sometimes they don’t all survive. My characters often surprise me, and that’s one of the most fun things about writing organically. Usually I start with nothing but a premise. What if a killer used a crime fiction writer’s books as blueprints for murder? (That idea became my debut novel, THE PREY.) I started writing and my main character took shape as she woke up and I wrote what I saw – how she felt, what she did, what she learned in that all-important first chapter. It set the stage for the entire book. Sometimes I start with a character. Obviously, if you write a series you already have a core character or two. But the plot itself? That comes as my character goes to work. I want to challenge them as well as provide an interesting and exciting story for my readers. What if Sean and Lucy are camping and come across a couple who are acting suspicious? What if Lucy’s mentor is killed at Quantico? What if a crime in Sean’s past is used against him? What if Sean learns he has a son – but his son’s step-father is a criminal? Almost always I write one or two paragraphs that summarize the core story, so in a sense I know the basics. I know what kind of mystery I’m writing—a thriller, a whodunit, a psychological suspense. I know the main character and the launch point of the story (a murder, a kidnapping, a prison break, etc.) Beyond that? Nothing. I often don't know who the killer is until my hero figures it out. And sometimes, what I think is the main crime in the first chapter is minor compared to what happens later! When you write organically you can't be afraid to edit. I cut and rewrite tens of thousands of words. My books usually exceed 100K words, but I often completely rewrite scenes, cut scenes—sometimes dozens of pages—and I’ve also been known to write completely new endings. The editor of my first 17 books at Ballantine told me she loved my revisions because it was like reading a completely new book and she never knew what was going to happen. Because writing is rewriting, I don't stress over word choice, scene blocking, or description in my first draft. I layer that in on the second draft. If I get stuck, I reread from the beginning or just skip to the next logical scene. I always ask, what would my character do in this situation? I try to avoid getting distracted by research unless it's plot critical. Meaning, if my character finds a dead body buried for 10 years I don't describe it in the first draft. When I'm done I'll figure out what they saw and set the scene. However if there is a critical clue where I need to know exactly how the body looks because that's important to the plot, then I'll pull out my forensic books, use Google, or call an expert. Since I edit as I go, my first drafts are fairly clean. Each morning, I re-read what I wrote the day before to make sure that it’s free of major mistakes and it makes sense. That process jumpstarts my creativity. I've published more than 30 books and haven't plotted or outlined any of them. My way is not the best way. It’s the best way for me. Writers write. It’s what we do. Find the best process for you, the way you can get from beginning through the middle and type THE END. Anyone who says you’re doing it wrong? Ignore them. I’m glad I did. So I’m going to ask you what Patti and I asked our workshops: what do you do when you’re stuck? Or, do you need help getting unstuck? Let me know and I’ll see if I can help! For the readers out there, can you tell the difference between books from plotters and books from people who don't plot? 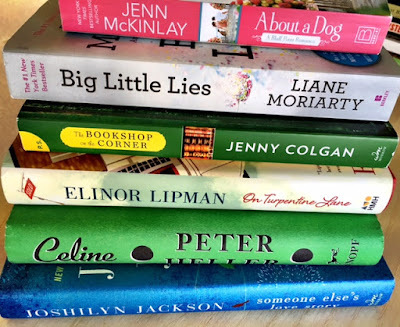 LUCY BURDETTE: I'm on a great reading binge right now--yay! One of the books I finished this month was BIG LITTLE LIES by Liane Moriarty. I read it after seeing the HBO miniseries starring Nicole Kidman and Reese Witherspoon. (I won't use spoilers in case some of you haven't seen or read it and plan to.) I loved the show, I think even more than I loved the book--though the book was a humdinger of a page turner. I wondered if this was an artifact of the order? Usually, it's the other way around, I like a book and so go to the movie and end up preferring the book. But this got me thinking about the process of choosing a book to be brought to life on TV or in the movies. And also some of the decisions about making changes. Which subplots would be better cut or added? And which characters could be eliminated because they really don't add to the story? (Madeline’s son for example in Big Little Lies, had very few lines of dialogue, and no forward motion depended on his character. Nor did he seem very important to his mother’s character. Cut!) I'm thinking about the book I'm writing now and who could be trimmed to tighten the story. This isn't a spoiler, but in the movie a pair of characters goes to a therapist. In the book only the woman goes. Why the change? And why change the ending? This seemed like a big adjustment that changed the character’s motivation for the accident. Obviously, I have more questions than answers. If any of you have experience with moviemaking or screenwriting, I’d love to hear your experience of how decisions are made. If you have none, and most of us don't, do you enjoy going to movies that have been made out of books? What about reading books where you've already seen the movie? Was there an adaptation that you thought did an especially good job? When the planets align, and you find a fantastic book written by a wonderful author and person, that is a day worth celebrating. That's what we're doing today, on the release day of Meg Gardiner's heart pounding page-turner, UNSUB. 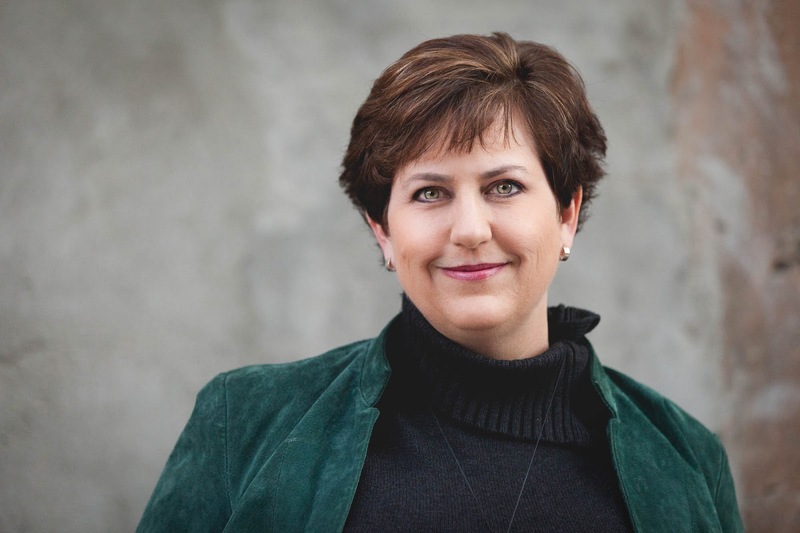 Meg is an Edgar Award-winning author of international bestselling thrillers that have been translated into twenty languages. She's a graduate of Stanford Law, a three-time Jeopardy champion, and her books have been lauded by USA Today, O, the Oprah Magazine, Kirkus Reviews, and the Guardian to name just a few. Stephen King said about Meg's Evan Delaney series “simply put, the finest crime-suspense series I’ve come across in the last twenty years.” And if that weren't enough, she is hilarious, gracious, and generous. 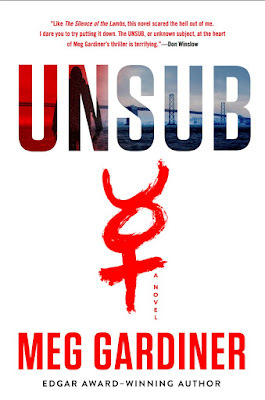 Meg was kind enough to send me an advance copy of UNSUB, and it's a nail biter. I couldn't put it down! I'm so thrilled she's stopping by JRW today. INGRID THOFT: Tell us about UNSUB, the first installment in your new series. 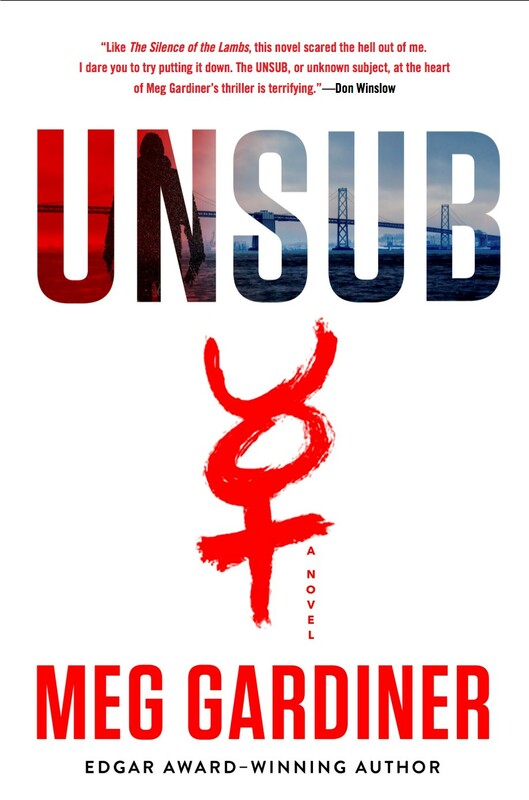 MEG GARDINER: UNSUB is a psychological thriller about a young cop hunting a legendary killer. The UNSUB—an unknown subject in a criminal investigation—begins killing again after a twenty-year break, and Detective Caitlin Hendrix must decipher his coded plan before he wreaks more havoc. The novel was sparked by the Zodiac killings. That unsolved case has haunted California for decades, and me since childhood. 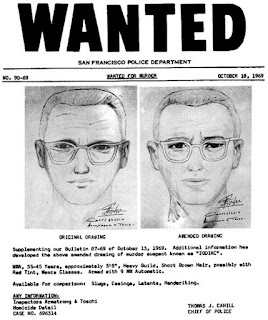 The Zodiac killed and injured seven people in the San Francisco Bay Area, and taunted the police and press with dozens of messages, including cryptograms that have never been broken. The killer has never been caught. In UNSUB, Caitlin Hendrix is drawn into the chilling world of the Prophet, who marked his victims’ bodies with the ancient sign for Mercury. The Prophet is Caitlin’s living nightmare. Her father, Mack, was the lead detective on the original case. The investigation shattered Mack emotionally and tore his family apart. The Prophet is a master of mind games. To stop him, Caitlin must do what her father couldn’t. She must decipher both the Prophet’s old, taunting messages and his strange new rhymes. What does the Mercury sign mean? What’s the Prophet’s end game? IPT: The main character, Caitlin Hendrix, is cop, as was her dad, and their relationship is pivotal to the story. What made you tackle a father/daughter relationship? MG: The action in the novel unfolds over ten days. But the case spans twenty-five years, and affects two generations. I wanted to tell it from the perspective of the cops working the case—who thread the line between relentless pursuit and dangerous obsession. The most affecting way to do that was to make those cops father and daughter. Mack knows the case better than anyone, but is a broken man. Caitlin desperately needs his help, but knows that drawing him back into the world of the Prophet could endanger them all. I’m a sucker for family stories. What can I say? IPT: UNSUB is so suspenseful that, at one point, I was curled on the couch practically in the fetal position while reading it. How do you get the rhythm and pacing right? I plan. I rewrite. Then I add a countdown clock. I want my novels to be fast-paced. Action and accelerating momentum help put the thrill in thriller. But the action can’t be unrelenting. In UNSUB, Caitlin runs 5K with friends, plays My Little Pony with a four-year-old, and gets a night of romance. I love it when readers tell me they find my books suspenseful. That’s not just because the pace is quick, or because the action is nonstop. The books can seem relentless because, even when the action stops, unanswered questions lurk in the background. The pace might let up, but the suspense never does. Each of the novel’s lighter scenes feed into the main plot. While Caitlin runs 5K, she talks about psychopathology. The My Little Pony playdate is interrupted when the Prophet delivers a video to a TV station. Caitlin’s night of romance starts out with a discussion of bomb making techniques. (Caitlin’s boyfriend, Sean, is an ATF Certified Explosives Specialist.) These scenes let the characters enjoy a moment of Zen, or ecstasy, or tequila. But unsettled issues continue to churn. Mysteries remain unsolved. Clocks tick down. The bad guy schemes, and sharpens his knives. IPT; Anyone who knows you, knows that you are a kind, thoughtful, funny (you have to follow Meg on twitter at @meggardiner1) person, but UNSUB has some dark, disturbing images in it. How do you keep that stuff from seeping into your otherwise sunny personality? Or is the sunny personality a ruse?! MG: Aww, thanks. It’s a balancing act. I write about what scares me, because I figure it will also scare readers. But I keep emotional distance from what’s happening on the page. At some point, I have to throw myself fully into the scene—to feel what the characters are feeling, so I can express that—but I do compartmentalize. As a writer, I take what frightens me and turn it into gripping fiction. I put my demons on the page, and turn them loose for readers to experience in the most exciting and suspenseful ways I can create. And we all have a shadow side. I follow Stephen King’s advice: “Go down to the basement.” Haul everything up. How else are you going to find depth? IPT: You clearly know your stuff when it comes to law enforcement. Whether it’s tactical strategy, explosives, or how various agencies interact with one another, it all rings true. Do you do a lot of research? MG: I do. I love research. 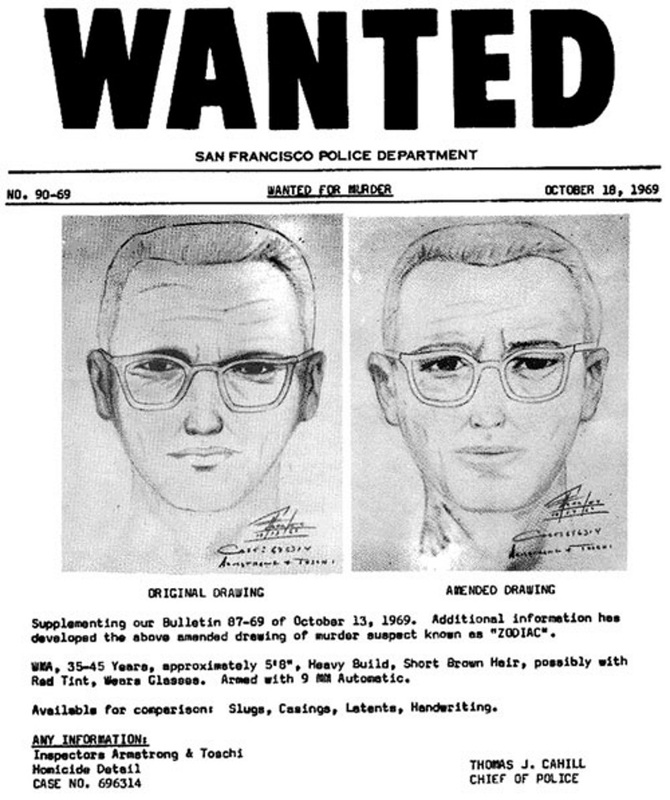 To write UNSUB, I delved into the digitized files from the Zodiac case. I read books by former FBI agents on criminal profiling. I rode along on patrol with the Austin Police Department. If I couldn’t learn something first hand, I watched videos. (Want to breach a building with a tactical team? Find training videos online.) Whenever possible, I talk to the people who do the job I’m writing about. There’s no better way to get things right, and—as important—to get a feel for what their lives are like. IPT: CBS is developing UNSUB into a TV series, and you’re going to be a producer. Can you tell us about that process? MG: I’ll be involved behind the scenes. CBS and the production company, Timberman-Beverly (which also produced "Justified," and produces "Elementary") are putting things together. More details to come! So readers, what really scares you? Do serial killers make the list? Meg is giving away a copy of UNSUB. Just comment to enter! The Evan Delaney novels feature a feisty freelance journalist from Santa Barbara, California. Stephen King calls them “simply put, the finest crime-suspense series I’ve come across in the last twenty years.” China Lake won the 2009 Edgar Award for Best Paperback Original. Later it was a finalist for NPR’s 100 Best Thrillers Ever. 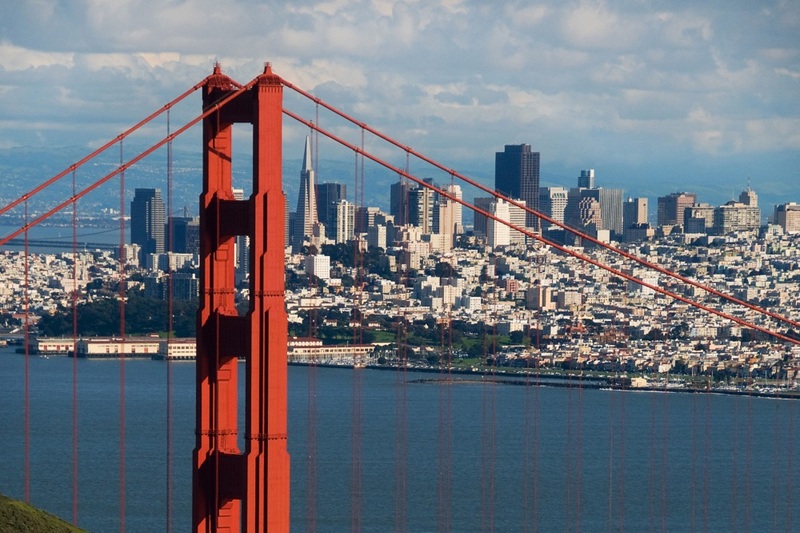 The Jo Beckett series features a San Francisco forensic psychiatrist. 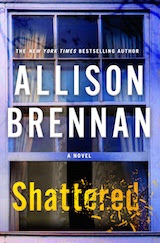 It includes The Liar’s Lullaby, The Memory Collector, and The Dirty Secrets Club, which was chosen one of the Top Ten thrillers of 2008 by Amazon and won the Romantic Times Reviewers’ Choice Award for Best Procedural Novel of the year. The Nightmare Thief, featuring both Jo Beckett and Evan Delaney, won the 2012 Audie Award for Thriller/Suspense audiobook of the year. Meg’s stand alone novel The Shadow Tracer was named one of Kirkus Reviews’ Best Books of 2013. Her current title, Phantom Instinct, was chosen one of “The Best Books of Summer” by O, the Oprah magazine. Meg was born in Oklahoma City and raised in Santa Barbara, California. She graduated from Stanford University, where she lettered in varsity cross country and earned a B.A. in Economics. She went on to graduate from Stanford Law School. She practiced law in Los Angeles and taught in the Writing Program at the University of California Santa Barbara. Later she moved with her husband and three young children to London. 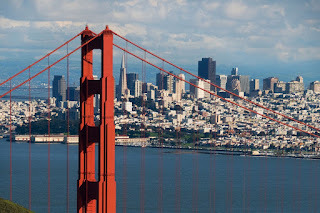 There she began writing mysteries set in the California she loves. She hasn’t stopped. Writing thrillers is job she’s immensely lucky to have. 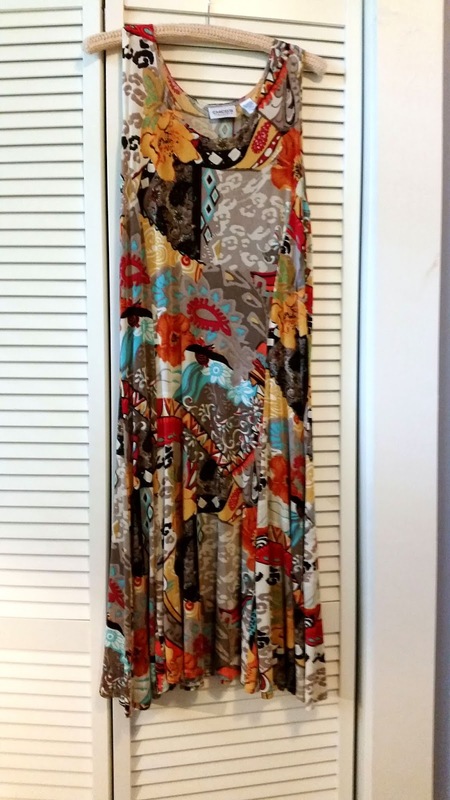 From Our Closets: Stay or Go? LUCY BURDETTE: I know we've talked quite a bit recently about decluttering and downsizing. But here's the problem I run into over and over: I have some items in my closet that I have not been able to throw out or recycle. Then I had a brilliant idea! I need some girlfriends to tell me the truth (OK can be boyfriends too) about these articles of clothing. And I figured the other Reds might have some items they want to model as well. So please, be kind, but be honest. I heard last weekend that overalls are cycling back into style. I used to wear the denim kind in my 20s. I've saved this short pair for a long, long time. What do you think? Hold or go? And here's one more. I know I wore these once to an Anthony awards brunch for which Six Strokes Under had been nominated for best PBO. I thought they were cute back then… And who knows when a pair of bright green silk capris might be needed again? Hold or go? HANK PHILLIPPI RYAN: I love you madly, Lucy, but trash the overall things. You may be connected to them emotionally, but you have outgrown them intellectually. Green capris? Keep. Totally. See? This is why it's a problem. I think the green pants are beautiful, with a crisp white tunic and chic sandals? Gorgeous. And now, checking my closet. And I know just what you mean. I am madly giving things away these days, but there are a few items I'm not sure of. Okay, how about these. SO hip. And they were hugely on sale. (Often a preface to an unfortunate purchase.) 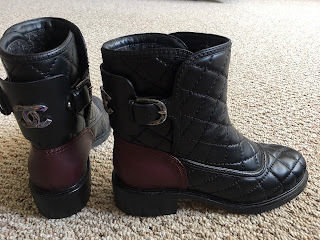 These actual Chanel boots were such a steal that I couldn't resist. (I will tell you the list price and the sale price if you are interested, but I fear the backlash.) I have never worn them. I just look at them. I love them. 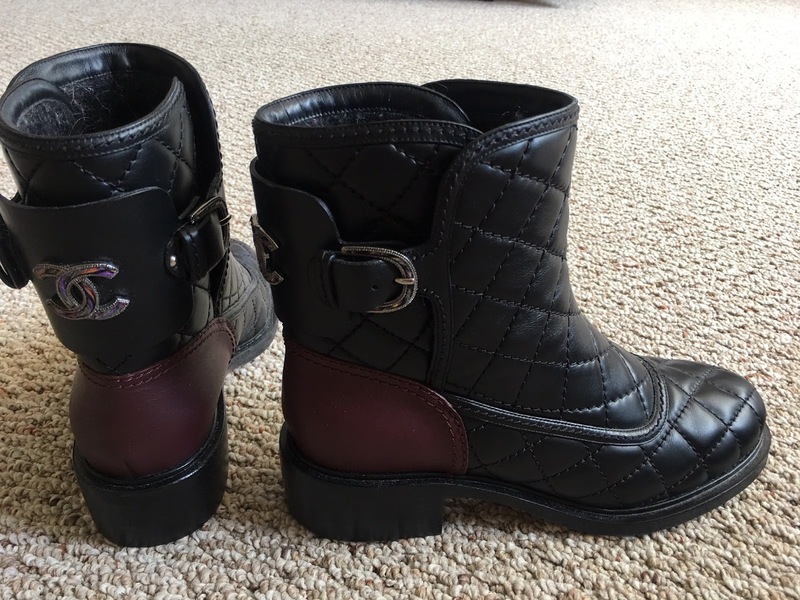 Look at the colors, the quilted leather, the cool buckles, the soignée Parisian ultra-stylish style. So punky and cool. (Can you tell from the photo?) But no matter what I do, I can't make them look right on me. If boot-cut jeans were in style, that might work. Hmm. So--I save them for another fashion swing. Should I just consign them? 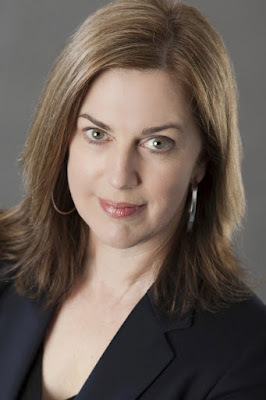 HALLIE EPHRON: Lucy: Save the overalls. For Halloween. Actually those aren't overalls; they're rompers. And they look pretty cute on you. The pants? Too shiny. Weird length. Call Goodwill. Hank: Save the boots...just because. I have very little in my closet that I don't actually wear. 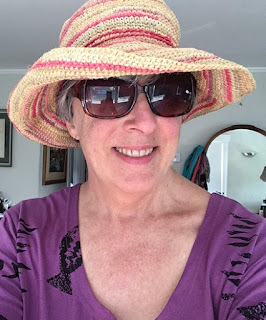 The oldest continually worn thing is probably a straw summer hat which squashes down to nothing in a suitcase. Once upon a time it was blue and purple and pink and red... now so faded. So useful. I will be sad when it gets holes. I've also saved the hat I wore to my daughter's wedding. It does not squash and when I look at it, it screams CHURCH CLOTHES. Still, I keep it. What think? Is it time to give it the heave-ho? HANK: Hal, that that does not say church clothes to me at all. I think I recognize the designer--but wear it to outdoor concerts, to shade your face on summer days, even wear it to the beach. Seriously! JENN MCKINLAY: I don't have much that I keep as I LOVE decluttering. Truly, the Hub and Hooligans hide their stuff from me because I have been known to be a teeny bit overzealous in my hauling of things to Goodwill. 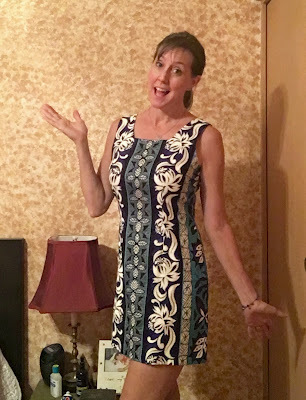 That being said, I have had this dress (that I never wear) in my closet since Hub and I honeymooned in Maui eighteen years ago. Yes, he has the matching shirt, which we also still have although he no longer wears it either. 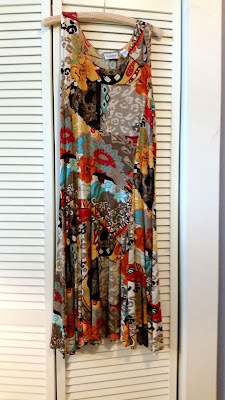 For some reason, I can not make myself part with this dress (or his shirt) even though the skirt is WAY too short for a woman solidly in middle age and his shoulders have become too broad for his shirt. Why am I keeping them? Sentimentality? How long does that last? Maybe I could make pillows for the patio furniture out of them...hmm. 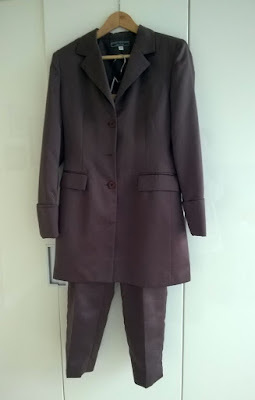 INGRID THOFT: Like Jenn, I generally don't have trouble getting rid of things, but the timing of this post is perfect since I just put this suit in a bag to go to Goodwill. I don't want to keep it, but I certainly need more encouragement to get it out the door! I wore this chocolate brown satiny suit at my rehearsal dinner almost 17 years ago. It still fits, but unless I'm auditioning to be one of the Pips in Gladys and the Pips, I think its day has come. I've known for about 15 years that it needed to go, but it was my rehearsal dinner! I suppose that as long as I've decided to keep the husband, that's all that matters. And Jenn, you look great in that dress. You should keep it; you never know when you might get invited to a luau! HANK: Ingrid—can you keep the jacket? Wear it open, with a white t-shirt, over jeans? LUCY: This is hysterical! I have a brown satin 3-piece thing too, Ingrid, so we can both play Pips. Hank, you are not helping us throw things out!! HANK: I know. I am part of the problem. Can't help it. xoxo But sometimes you have to think of clothing (like Hallie's hat, or Ingrid's suit. Forget about "suit") in another way. That's what friends are for. Or something. What do you think of our problem clothing, REDs? Keep or toss? And tell us about something you can't quite part with? Yes, I am absolutely unabashedly gushing. He is one of my favorite authors ever. 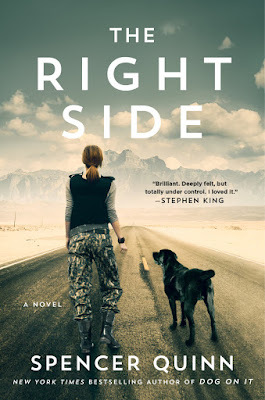 And now he (as Spencer Quinn) has a new book out in two days, THE RIGHT SIDE. It’s a different incredible...well, now I am gushing again. HANK: I'm in the midst of your wonderful book right now (oops, still gushing)--so don't tell me the ending. But I'm fascinated by what you said on your website--how sometimes a character grabs you and won’t let go. you said: "This character – a figment of your own imagination but not wholly under your power – demands to be brought to life." So that's what happened with your main character in THE RIGHT SIDE, LeAnne? Tell us about that. who is she, and where did she come from? SPENCER QUINN: Publishing - what a crazy business! On the outlet end, it's more and more data and numbers driven all the time, as though the product was sheet steel. We workers back at the inlet end deal in feelings, dreams, emotions, zeitgeist. Strange things go on in that pipeline. LeAnne Hogan came to me suddenly, out of the blue. The Chet and Bernie mysteries - and Bowser and Birdie for kids - which have been occupying me for almost the past 10 years are probably essentially comic in tone. And I love writing them! But what I think happened is that things going on in the world that are not comic came barging in and couldn't be ignored. LeAnne lives in this dangerous, baffling, violent world which I must have been grappling with subconsciously and when she popped up in my imagination I knew had to write about her. I'm not saying she's humorless - far from it, I hope - but she's been in terrible situations that brand you forever. In THE RIGHT SIDE, she is forced to solve two mysteries, one macro, one micro. LeAnne's highly capable of doing that, or at least she was. She's a soldier and a warrior, beloved and respected by her comrades; but then her patrol wanders into a mysterious set-up in an Afghan village, and it all comes undone. I've explored the idea of a highly capable person forced to carry on with suddenly diminished abilities once before in OBLIVION, but this turned out quite differently. And one of the reasons for the difference is the strange dog who enters LeAnne's life when she really needs her, even if LeAnne doesn't know it at the time. 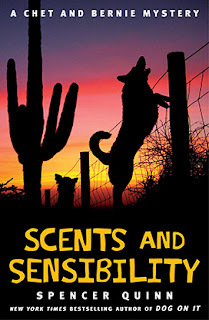 HANK: But even though you’ve written riveting standalone thrillers, and the smart and (okay, adorable) Chet and Bernie mysteries, and the Bowser and Birdie YAs (and more--I adore your Echo Falls books) --but this book is so different. It has a different tone, and a different...aura. Did it feel different to write it? SPENCER QUINN: Good question. That aura thing came up in a conversation with my editor. He said reading the book reminded him of the feeling of getting swept along in a piece of music by Philip Glass. I'm no expert on Philip Glass, but chose to take it as a compliment. There were a lot of technical challenges in the writing - it's part war novel, part mystery, part road book, and moves back and forth in time - but I wasn't really aware of them until I was done. Thank God! Those challenges can be intimidating. Better not to know. As for the feeling of writing it - well, I'm not sure. There are always surprises. For example, when I made LeAnne a high-school pole vaulting champion, I had no idea there'd be that scene in Afghanistan where she tries to teach the schoolgirls in their burqas how to pole vault. And how, much later, she tries desperately to remember their names. One thing I do know is that the writing process never gets easier. That seems unfair. After a dentist has filled 1000 cavities or so, autopilot must set in. Why can't we have that? HANK: Well, it’s good, really, isn’t it? Because to have the joy of a new idea, or a new insight. 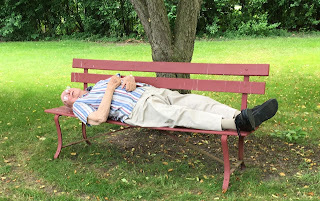 People have said to me—“After 40 years as a reporter, don’t all stories seem the same? Like how many ways are there to cover a fire?” And that’s so—wrong. Every situation is astonishingly different. In fiction, there are even more possibilities. And having a good idea is the best thing that could ever happen. SQ: Well, I knew from the start that I wanted a dog in the story - but not a narrating dog! THE RIGHT SIDE is all third-person close. And this dog had to have been through something bad - although we never know exactly what - and like LeAnne, bears the scar. And like her, the dog is not in a cuddly mood, at least in the present. As for the future, I hope readers see the ending as an up note. HANK: there’s such a layer of melancholy and sorrow and loss at the beginning of the book. Was that difficult—more difficult than writing always is anyway—to write? SQ: The truth is the parts of a story with heightened emotions, like the beginning of THE RIGHT SIDE, and heightened action, are easier to write, at least for me. It's the getting to them that's hard, often a slog. In this book, I tried to simply jettison most of that slogging. HANK: Jettison the slogging! Ah. My new mantra. Talk about that title—so multi-layered! Did the story come first, or the title? SQ: The moment I picked the side of LeAnne's face that would be damaged, I had the title; and all the metaphoric ripples got set in motion. HANK: And not to bury the lede, but you have reached blurb nirvana. Stephen King said “Brilliant. Deeply felt, but totally under control. I loved it.” Not to be sappy, but okay. How did you feel when you read that? The totally under control part is so fabulous. And, yeah, brilliant is good. SQ: I was very glad to see this blurb. The implication is so right: simply having the deep feeling is not enough. Someone (and of course it's the same dude!) who's almost stern has to be at the controls. HANK: That’s such a terrific image—flying high, but under control. Have a great time with the new book! So exciting. So, Reds and readers, who’s your favorite dog in fiction? And a copy of THE RIGHT SIDE to one lucky commenter! Peter Abrahams is the Edgar award winning author of thirty-six novels. Among his acclaimed crime thrillers are Oblivion and The Fan (filmed starring Robert De Niro). Under the name Spencer Quinn, he writes the New York Times bestselling Chet and Bernie mysteries and the middle-grade Bowser and Birdie series. The Right Side – the story of a wounded female vet – comes out June 27, 2017. Take the Jungle Red Seatmate Quiz! Pen names, Pseudonyms, or Nom de Plumes. Author Websites: What's the point? Author's Virtual Assistant Jenel Looney!